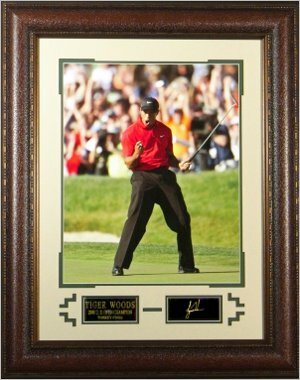 This is an Tiger Woods custom premium leather framed unautographed Signature Engraved oversize 34x25 piece. This photo of Tiger Woods is from the 2008 U.S. Open Championship after his winning shot at the 2008 U.S. Open Torrey Pines. Possibly the most exciting U.S. Open in history. The 2008 U.S. Open started with talk over Torrey Pines and its ability to provide a championship test. It ended with Tiger Woods limping away with the USGA's shiny trophy, calling it "probably the best" of his 14 major championship victories. Whether it was Woods sinking two eagle putt bombs and a chip-in birdie in the back nine of his third round, grimacing all the way, runner-up Rocco Mediate's inspired, fan-chant-inducing play, Phil Mickelson's decision to go without his driver the first two rounds, or the crowds that kept filling Torrey Pines, this Open produced storylines galore. It took five days and 91 holes (including that 19-hole playoff Monday between Tiger and Rocco) to complete.